Novice investors like you and me are under the bounden duty to keep an eye on the performance of illustrious investors. This exercise keeps us inspired and ensures that we stay on the right path. 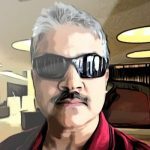 A few days ago, we saw the returns delivered by Manish Bhandari’s Vallum Capital PMS, AlphaInvesco (a reputed stock advisory firm), and Porinju Veliyath’s Equity Intelligence PMS in the fiscal year 2015-16. Prof Sanjay Bakshi’s PMS is called ValueQuest India Moat Fund. It is run by a company called ValueQuest India Moat Fund Limited, which is based in Mauritius. The objective of the ValueQuest India Moat Fund is stated to be “to deliver high risk-adjusted returns”. It is also stated that “The Fund invests in Moats, i.e. companies with businesses possessing what the Manager believes are sustainable competitive advantages”. 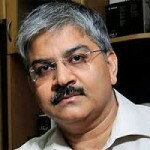 In a post at the microcap club, Prof Sanjay Bakshi revealed that the ValueQuest Fund has a “concentrated portfolio” and that it has invested in stocks which have “very high quality of earnings”, “exceptionally strong balance sheet quality” and “highly scalable businesses”. The holdings of the ValueQuest India Moat Fund are not known in their entirety. Some stocks which are known to be in the portfolio include Ambika Cotton, Poddar Developers, Wim Plast, Ashiana Housing, Accelya Kale Solutions and Kitex Garments. In an earlier piece, I lamented that the performance of the Prof’s favourite stocks (some of which are in the portfolio of the ValueQuest India Moat Fund) is quite disappointing. Some worthies like Vaibhav Global and Kitex Garments have been beaten out of shape in the wake of poor operating performance. Of course, some stocks like Wim Plast and Relaxo have put in a spirited performance and notched up hefty gains. 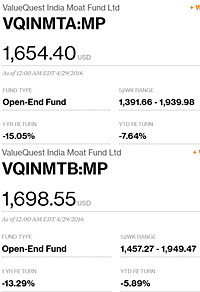 It appears from Bloomberg that the ValueQuest India Moat Fund has two schemes with the ticker symbols “VQINMTA:MP” and “VQINMTB:MP”. The difference between the two schemes is not known. My uneducated guess is that the distinguishing alphabets ‘A’ and ‘B’ in the symbols may stand for ‘Alpha’ and ‘Beta’ respectively. 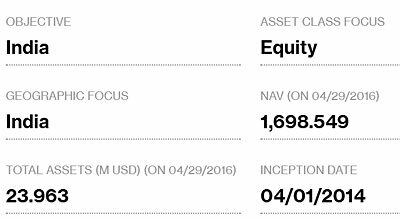 “VQINMTA:MP” has, as of 29th April 2016, lost 15.05% on a YoY basis and 7.64% on a YTD basis. “VQINMTB:MP” has, as of the same date, lost 13.29% on a YoY basis and 5.89% on a YTD basis. This performance is quite disappointing when we bear in mind that Manish Bhandari’s Vallum Capital PMS was able to clock in an impressive 26.7% return in the fiscal year 2015-16. What may have also taken a toll on the performance of the ValueQuest India Moat Fund in dollar terms is the adverse movement of currency. In the period from 1st April 2015 to 31st March 2016, the rupee has depreciated by about 6.74% from Rs. 62.09 to Rs. 66.28 in relation to the USD. This means that an investment of $1,000 made in Indian equities as of 1st April 2015 is worth $936 as of 31st March 2016, all other things remaining unchanged. 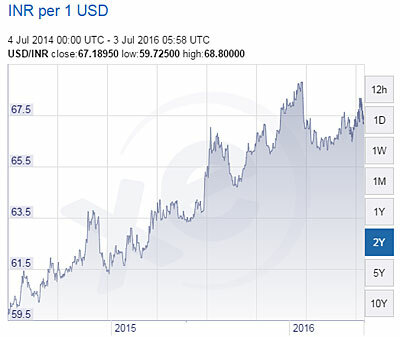 In fact, the situation has worsened because the rupee has depreciated further to Rs. 67.18 per USD as of date in the wake of the Brexit crises. Bloomberg also stated that the total assets of the ValueQuest India Moat Fund Ltd stands at $23.963 Million which works out to Rs. 161 crore. Prime facie, the AUM of Rs. 161 crore is not a very high figure considering the stature that Prof Sanjay Bakshi enjoys amongst cognoscenti investors with deep pockets. In fact, in the same period, the AUM of Porinju Veliyath’s Equity Intelligence soared 78% to Rs. 392 crore coupled with a steep increase in the number of clients. My guess is that these are early days for the ValueQuest India Moat Fund and that in the foreseeable future it can be expected to grow in AUM and to post stellar returns under the able guidance of Prof Sanjay Bakshi! I don’t understand why people invest in any of these PMS. To all the readers, be it PMS of Sanjay Bakshi or Porinju or Manish all have under performed. The returns are much less that given by Prudent Equity. Check their website. Talk to the advisor who has more than 20 years of experience in stock market. His number is there on website. He has amazing knowledge. I am a subscriber and enjoying fantastic returns. Much better than all above PMS. Decision is all yours. Mohit share there rec. So we also get benefit. You tell me — If you had subscribed, would you leak the recommendations to others. Why don’t you subscribe to the advisory. Cost as compared to benefits is nothing. You should actually call the advsior and clear your issues. If you want to discuss with me, you may post your contact details. I will connect with you. How easy is it to take position at the price on their reco? Do the stocks jump immediately after the reco? Then some gains remain on paper. You will get SMS and mail. You can easily buy in the range. Post your buy price will always jump and will be out of range. Good for investors . PMS returns are always in pvt domain we never know right data on performance. Some of them have crore rs ticket size. Pl suggest some PMS for 25 lakhs having good consistent performance. Why again and again topics on PMS ? when we have good Mutual Funds. Anything or everything sells in India if you talk WB. What is correlation with WB way of investing and stocks you buy? Does WB style tell you can invest in microcap junks? Eventually, Mr. Market will punish one who is “one match” wonder. I enjoy reading Sanjay however negative returns are quiet bad. Stocks such as Vaibhav are just scrap. Mohit yes I will. We are here to help and don’t always relaid on tips.if u get it better to share.if something negative , we may know by sharing. Buy tnpl good fandamental. Sorry. I can’t leak his recommendations. if you want to subscribe, we can get in touch. Hi Mohit ..How can I connect with you .? My email whirlingwoods@yahoo.in . As someone mentioned elsewhere, if you bought any private sector bank, it would have beaten the returns generated by Prof. Bakshi’s fund over its lifetime. So much for a stock picker! Relaxo Footwear’s is looking better as far as fundamentals are concerned. PE ratio is on higher side which can give some buying opportunity to the investors if it dragged down. Otherwise, revenues are growing with better rate and so as the earnings. The company is reducing the debt significantly. It could be a buy with long term vision. Value quest moat fund have exited from Ashiana Housing , name disappeared from latest shareholding published in ashiana housing website .